Transit managers suggested a more flexible policy in response to the March 16 incident at UW Station, when both downward escalators from the mezzanine to the train platform stalled for more than three hours. The station has no stairs. Sound Transit has come around to the idea that in dire circumstances, it’s OK to use a stalled escalator as stairs. But that’s only when no other escalators or staircases are available. And those stationary escalator steps are secured so they don’t suddenly move or break apart. And transit workers are there to guide the elderly and folks with luggage. Or, the agency might instead detour people through a station’s emergency-exit stairs, concealed behind dark doors. Sound Transit expects to choose one of those two strategies as its contingency plan in case of escalator failure at University of Washington Station, where stalled escalators last month forced hundreds of people to wait at street level for an elevator. Transit managers suggested a more flexible policy Thursday in response to the March 16 incident, when both the downward escalators at UW Station from the mezzanine to the train platform were stalled for more than three hours, until technicians arrived to fix them. Security guards blocked other access besides the elevators. An average 9,700 people board a train daily at UW Station, the second-busiest stop on the 21-mile corridor. The agency initially said walking on a stopped escalator would violate international codes and posed safety hazards. However, those codes are actually standards set by groups such as the American Society of Mechanical Engineers. There’s no applicable law in Washington state. “We can use them legally, but can we use them safely and efficiently?” said Jim Niemer, a transit staff attorney, in a briefing to the transit board’s operations committee. After further review, the safety division found that, if precautions are taken, using a stopped escalator as stairs creates only an “occasional” risk of injury that would be of “moderate” severity, Niemer said. Escalator steps are 8 inches high, compared to 7 inches for concrete stairs. The main safety risk is at the top or bottom where step heights vary, officials say. The escalators-as-stairs question applies only to UW Station, Capitol Hill Station and the U District Station, set to open in 2021. Those stations have deep train platforms that are reached only by escalators and elevators. They have no stairs as an alternative. However, Sound Transit CEO Peter Rogoff said the agency is “considering how we might shoehorn stairs” into U District Station, and at what cost. Future stations are already designed, or will be required, to include a staircase between each level. “When I go to the East Coast and ride transit, it’s always there ­— I can ride the escalator and the stairs,” said board member Kent Keel of University Place, near Tacoma. Sound Transit is also imposing stricter rules for security guards to watch and report stopped escalators, and for operations staff to call technicians immediately. Agency spokesman Geoff Patrick emphasized that after frequent breakdowns in 2016, the UW Station escalators work 97 percent of the time, but at extra cost for parts and maintenance. 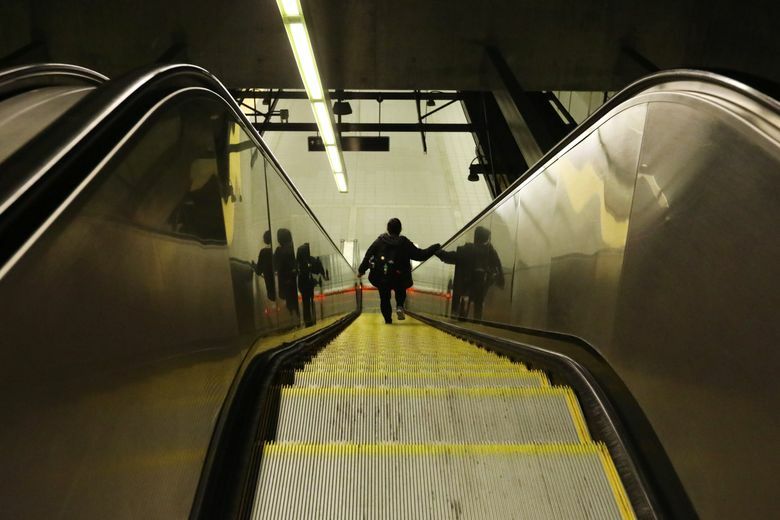 Sound Transit will study replacing the 2-year-old escalators with sturdier models.